The Friendly Farm - Online Ticket Sales! Save every time you visit! 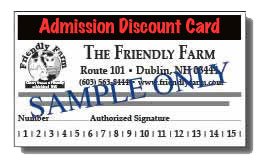 Our Friendly Farm Admission Discount Card can help you save money every time you visit. Here's how it works: Rather than paying regular admission price ($8.50 for adults, and $7.50 for children) you pay a flat fee of $82.50 for 15-admissions (plus $3.00 for shipping & handling). This works out to just $5.50 per person in your party. You can share the card with friends and use it anytime. There is NO expiration date! Simply fill out the form below and charge it to your credit card. We'll mail you the card(s) in about a week. It's safe and secure. They also make great gifts! Comments: Use for mailing information (if other than you) or any other questions. *Please enter the text from the box above for verification purposes. Note: This is to help prevent spam. The letters are all lower case.